I want to take this opportunity to thank everyone who helped me in this crucial life goal. I never could have done it without you. Thank you. Besides, I’ve already lost lasermacaroni to a blogger with far more google juice. Congrats Josh. Glad to see you’ve reclaimed your name. And sorry to hear you’ve lost lasermacaroni–I swear I was only trying to help! Who cares about Google rankings? 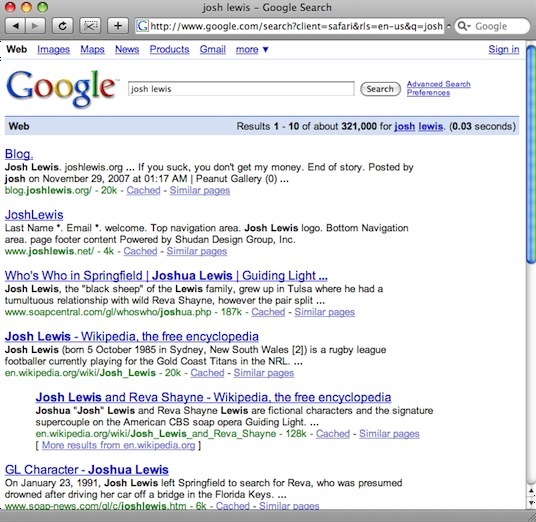 it’s all about Yahoo!’ search results in which case you’re number 1! Now lets hear the yodal, Yahoooooo!